In stock -This product will ship today if ordered within the next 8 hours and 16 minutes. 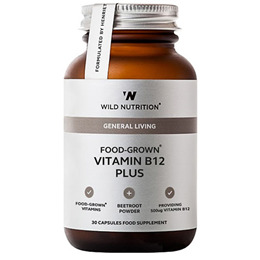 Wild Nutrition`s Food-Grown Vitamin B12 Plus has been expertly formulated to support the normal function of the immune system, the reduction of tiredness and fatigue and homocysteine metabolism. Healthy homocysteine metabolism is required to support the ageing brain, psychological wellbeing, cardiovascular health and fertility. Vitamin B12 levels may decline as we age, and certain medications are also known to reduce B12 levels. The Food-Grown Vitamin B12 provides the preferred food-form methylcobalamin and deoxyadenosylcobalamin, as well as organic beetroot powder for healthy red blood cell formation. Wild Nutrition`s Food-Grown B vitamins are provided in a naturally methylated form. Mineral enhanced Yeast providing Vitamin B12 and Organic beetroot powder, Vegetable Cellulose (capsule shell). If you are pregnant, breastfeeding, taking medication or under medical supervision, please consult your healthcare practitioner before taking any food supplements. Below are reviews of Wild Nutrition Vitamin B12 Plus - 30 Capsules by bodykind customers. If you have tried this product we'd love to hear what you think so please leave a review.